In the coming week, we will expand our Real-Time Targeting test for Facebook Ads on Marketplace to 100% of users worldwide. This targeting feature can speed up the delivery of ads in real-time based on a set of qualified actions a person takes on the site. We’re using the same data that we already use to serve ads to our users, but this enhancement will allow users to see ads updated in real-time based on their activity. We’re excited about this test, because we think it makes your ads more relevant to users by allowing you to reach users at a prime point in the purchase cycle – right when they are indicating intent. There is no change in the ad product itself or to user privacy, and no action is necessary on your current Marketplace Ad campaigns—real-time targeting will happen automatically for people who become a part of your target audience. In real-time, we can target specific keywords from the text the user entered or the Page they liked and update the 1-5 Marketplace Ads they see that is relevant to the keyword/concept. Happy Monday, indeed. Seriously – this is big stuff. On one hand, I’ve talked to some folks who are freaked out and think there’s some new privacy issue here. It’s the usual “OMG! They’re watching me! I’m quitting Facebook!” News flash: they’ve been watching you all along. On the other hand – for advertisers, this is huge – we can engage Facebook users in the moment. TONS of potential. But the jaded side of me thinks we’ll keep seeing more of the same poorly targeted ads. The tools have always been there, but lots of advertisers still do a really bad job with their Facebook campaigns. Poor strategy is poor strategy – making it faster doesn’t make it any better. AT&T will still show me their “Sign up for AT&T” ads every time I post in frustration about the “network quality” in San Francisco- they’ll just be quicker about it. And I’ll get more of this ridiculousness, in real-time! Go Smile, where I’m General Manager of eCommerce, was featured in the Jill’s Steals and Deals segment of the Today Show in late 2010. Obviously, this was huge in many ways – the traffic spike was unbelievable. The website was almost instantly brought to its knees. I’d been talking to the folks at Infused Commerce about their Facebook Store solution, and reached out to them to see if we could get something live quickly enough to help serve the massive number of folks coming to the site as a result of the Today Show deal. Keep in mind, this was short term demand – the deal was supposed to last 24 hours, and although we had upgraded our servers in preparation for the traffic, it wasn’t enough. We were turning away site visitors – a bad experience for would-be customers, and a loss of opportunity in terms of new customers, email signups and brand reputation. Incredibly, the guys at Infused were able to get our Facebook shop live within hours. We posted the link on our temporary home page, and by the end of the day had processed a huge number of orders through the Facebook store – almost twenty times our normal daily website order volume in a single day. The launch was a resounding success, and really helped mitigate the poor experience experienced by some folks having issues ordering on the main site. Unfortunately, due to some issues we ran into while trying to integrate with our fulfillment partner (who will remain nameless) we had to take the store down temporarily. We thought it’d be down for a few weeks at the most, but due to a an ridiculous comedy of delays and freakouts from the fulfillment company, it took months to make the integration happen. We finally launched the Go Smile Facebook store again last week. We haven’t been pushing it much just yet – taking a few orders and watching for issues with the fulfillment integration. But I’m planning some excellent campaigns very soon – this is a powerful tool to drive not only orders and revenue, but fan count and engagement. More to come on that soon. Right now, the Infused Facebook shop application works in typical product feed fashion – very simple. The store itself is a Flash app that lives in an FBML tab on your company’s Facebook page. If you’ve sold stuff or advertised on Amazon, you’ll be able to set up your Facebook shop in your sleep. The Infused team sets up the store with your brand colors – you just need to provide some basic files like a logo and a “front door” image along with your product feed, and you’re ready to roll. The orders are pulled from a secure URL. Easy peasy. I can’t say enough nice things about the Infused team. While the curent beta version of the Facebook shop sports a pretty basic feature set, they’re moving fast – they’ve made vast improvements to the product since I first talked to them a few months ago. There are other companies doing this, but it’s been a pleasure working with them. It’s a classic startup story – they’re new and hungry, with a small agile team capable of moving very quickly. Their customer service has been excellent, and they’re attentive to our needs. They eat up feature requests like candy, and in some cases stuff I’ve asked for has shown up a few hours later! The pricing is excellent, too – less than most companies give up to affiliates, and there’s no commitment. Small brands – this is an easy, effective way to make your Facebook page a powerful tool in your customer acquisition toolbox. The buy-in is very small, and implementation is incredibly easy and fast. Do it now! I almost always spend at least a few seconds (practically a lifetime, in the context of email marketing!) looking at the emails LinkedIn sends my way. 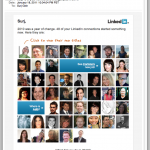 The “LinkedIn Network Updates” are particularly interesting. I’m curious – I like to know what folks are up to. Previously, these emails have been pretty much html text with links on my connections’ names. Last night, LinkedIn sent the first email I’ve seen from them that really takes advantage of one of the powerful assets they have – user photos. This isn’t an entirely new concept – MailChimp has had some social features for a while, although they had to rework them recently. One of the changes was the loss of the Faces feature. And Twitter’s “”new follower” email has incorporated the user icon and basic info for a while now. But this LinkedIn email takes it further. "Surj, 48 of your connections changed jobs in 2010 - and here are pictures of every last one of 'em!" “Email personalization” still means “insert FNAME in the body somewhere” to a lot of email marketers. 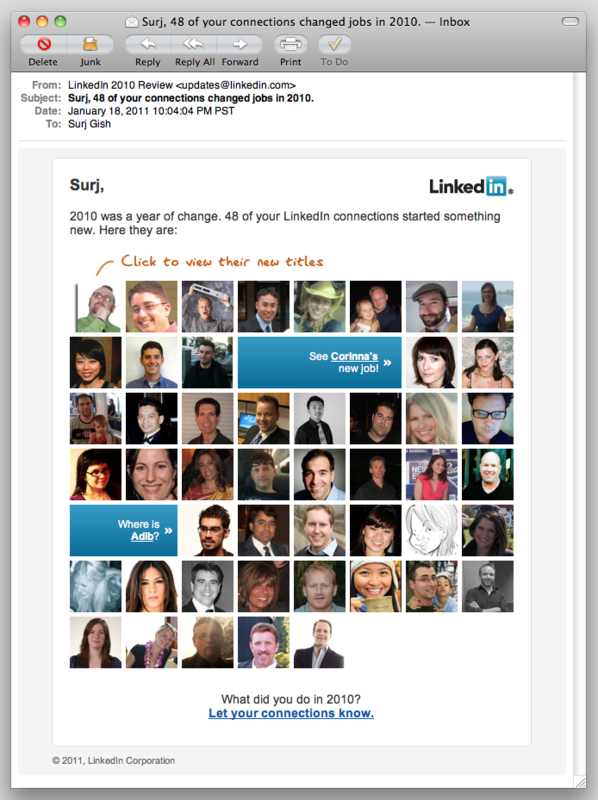 LinkedIn sent me an email with pictures of 48 people I know. You’re damn right I clicked on every one of them. Ok, maybe it was just most of them, but this is a very compelling way to drive visits to LinkedIn – here come the ad impressions! Is this a test to see how users respond to photographs, before including photos in the network update emails? I wouldn’t be surprised if we start seeing photos in the regular updates emails soon. What can we learn from this? The vast majority of email marketers don’t get to send their subscribers pictures of their friends and colleagues. We personalize based on purchase history, previous activity, and (hopefully) intelligent guesses. So how can we get creative and take our email personalization to the next level? Yes, I said “take it to the next level” – sorry. How about “raise the bar” instead? Another question – why is Facebook still sending plaintext email notifications, instead of taking advantage of the vast wealth of stuff they have at their disposal? Is it concerns about privacy and privacy settings, or is just that most Facebook users are simply on the site so much more than LinkedIn, and don’t need as much enticement to be sucked back in?